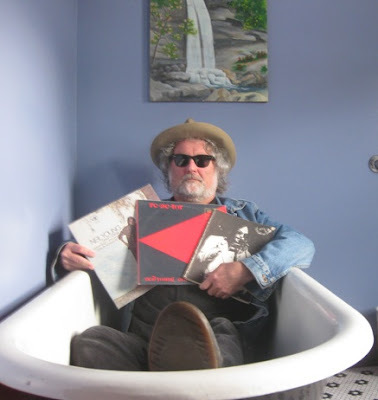 Singer and songwriter, Scott McCaughey -- a longtime Neil Young fan -- is the leader of the Seattle and Portland-based bands The Young Fresh Fellows and The Minus 5. I know that when we talked last time that you don’t collect a lot of memorabilia, but what was that one Neil-related thing at your house that you showed me? The picture on the wall? That’s not even memorabilia, that’s history! (laughs) That was me and the R.E.M. guys backing Neil on “Ambulance Blues” at the Bridge benefit concert. We’ve done it twice but that time we backed him on “Ambulance Blues.” That was Peter’s and my idea. We submitted a list of songs we thought would be cool to do with him. We actually rehearsed “Ambulance Blues” and “On the Beach” but he liked “Ambulance Blues” better. He started playing it after that but he hadn’t really done it live since ’74, since it came out. I feel like we maybe got him back into the song a bit. I’ve seen him play it again since then. That was pretty amazing. I’ve got some other weird Neil stuff lying around. I’ve got the matchbooks from the ’78 Boarding House shows that say, “Neil Young World Tour 1978” and it was five nights at the Boarding House, which I think were the only shows he did that year. This is when he debuted a lot of the Rust Never Sleeps stuff before it came out. I’ve got a weird Re-ac-tor where it’s the vinyl with the labels on it but it never got pressed. So it’s like this big hockey puck of vinyl with the Re-ac-tor labels on it. It’s really cool. I’ve got tons of other stuff too. Yeah, I’m pretty ridiculous when it comes to Neil. Full interview with Scott McCaughey on Neil Young Spectrum Culture. Get interview and thanks for sharing with everyone. Interesting take and thoughts on Neil from someone who's obviously one of us! I shared a beer with Scott once and he's very cool and friendly; also quite erudite, as you can gather from the interview. I've seen Minus 5 play in clubs and it's always great, whether on their own or supporting someone else (e.g. caught them once backing the incomparable Cedell Davis). Scott also plays in The Baseball Project along with Pete and/or Mike Mills, plus Steve Wynn and Linda Pitmon. In fact, they are on a short tour now and are at City Winery in a couple nights as part of CBGB Fest (attention all NY fans in the NYC area)! I bet he's gonna see Journeys, too. Something to look forward to it.